Another pin for Trish's Pin It and Do It Challenge. This time I crocheted a Dorothea dish towel from Lion Brand. I used Bernat Cotton in Country Red and Vanilla Bouquet. The only thing I had trouble with was the colour changes. I always have trouble with that. Not changing the colours, but making the places where the colour changes look neat. I'm fussy. I'm reluctant to use the dish towel though! I don't want to ruin it after all my work. It's lovely! Reminds me of some fruity sorbet. I wouldn't use it either, too cute! Pretty! The most I've ever crocheted was a potholder. It was not "relaxing" like my grandmother told me it would be. 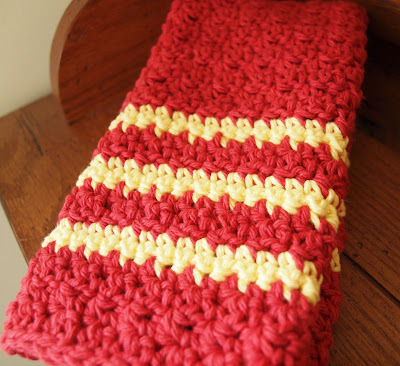 I've used dish rags that are crocheted but I never tried a towel made from yarn. How do they work for drying? Pretty colors! I'd be reluctant to use it, too.